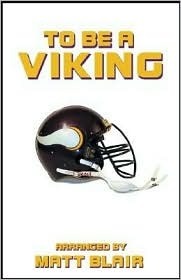 All right, the truth comes out…I am a long time, die-hard Minnesota Viking fan. I’m not sure how or why this particular book came to my attention, but I’m glad to have had it available to me. Matt Blair, a familiar name to Viking fans, interviews a variety of former Viking players and personnel and shares them here. We get some sports stats that might otherwise be unknown (the sports each athlete played in high school and college) and then a series of questions and answers. Blair takes his role as a former Viking very seriously, which I greatly appreciate. It has meant something to him to wear the purple and gold, and I feel as though he’s hoping to get some similar responses from those he interviews. Not everyone responds in kind, however. In fact some of the responses make it seem as though the player didn’t remember being with the Vikings (punter Darren Bennett for example). Still, this was, over-all, a really nice, leisurely read, and I enjoyed the insight to many of the players. And I’m old enough to remember all of them! Looking for a good book? Fans of the Minnesota Viking football team will enjoy this unique look at a number of former Viking players.